Joel and Ethan Coen tend to make movies that are timeless. I'm not really referring to staying power in modern cinema, though that too applies, but in the physical texture of their work -- whether it's award-garnering drama or grin-inducing ironic comedy (or, at times, a mix of both). Even if they bluntly profess a time or era in which a specific film takes place, the barefaced close-ups, surgically-used music, and sheer energy buzzing frame-to-frame captures an almost otherworldly essence that, in a way, feels as current as the day the raw footage was shot. This quality can be traced all the way back to Blood Simple, the brothers' twist-heavy Texas neo-noir and first feature film. Cowboy boots in neon signs and the loud calculating of a green-screened computer melt into the backdrop, becoming eerily-magnetic accoutrements that do nothing but add resonant visual flare to this taut, superlatively-made thriller. As you dig into what the Coens have concocted, you'll quickly realize that they have a firm grasp on film noir and are disinterested in mucking with its flow; none of the characters can be trusted, they've all got their fruit-bruises, money's thrown around, murders are plotted, and backstabbing abound. At the center of the story, one tough to summarize but easy to follow and grounded in familiar footing for genre hounds, a bartender (John Getz) has been sleeping with his jealous boss' wife, Abby (Frances McDormand) -- a woman known to mingle with other men around town. The bar owner (Dan Hedaya) isn't happy about it, leading him to throw both his weight and cash around to "fix" the situation. Revealing any more might cripple the enjoyment in watching the film unravel; needless to say it takes turn after turn from there, throwing in the involvement of a stocky, dangerous private investigator (M. Emmet Walsh). Blood Simple's straightforwardness allows the extent of the Coen Brothers' talent to speak for itself, and something surprising happens as a result: their attentiveness to setting and tempo moves in front of the lean storytelling, allowing their attuned perspective to bolster the anticipation in seeing what they're going to throw at us next. That's not to say that the script they've penned isn't involved, or uninvolving; the dialogue maintains a stylish, serrated attitude with copious amounts of gravity rooted in deceit and suspicion, while the rhythm of twists in the bars, houses, and overlooking bluffs keeps the viewer satisfyingly on their toes. But it's also pared down to the essentials, never squandering lines or tossing in overtly bizarre flourishes (even fish flopped on a desk are pertinent). This is succinct, innovative construction with a purpose, where details not only matter, but directly accentuate the tone. That purpose is to generate a slow boil of tension -- along with splashes of pitch-black, blink-and-you'll-miss-it humor and unquenchable guilt -- to which the Coen Brothers sustain at a high-caliber until the credits roll. Lots of deaths occur in the film, as if the title wasn't indicative of that, and none of it is smooth, calculated, or even certain; it's all by happenstance, which seems to be tearing these people down in some form of deadpan karmic balancing act. Layer after layer drapes atop the actions of the cheating couple, backstab after backstab, and the audience is the only one privy to the extent of the convoluted scheming and knowledge of the events. A continuous play on audience awareness will become a concurrent theme in the brothers' work, strengthening both tension and humor by playing with our knowledge of the film's developments, but it's at its more pure and incisively cunning here. A degree of polished artfulness is also at-play that simply doesn't befit a first-time effort; the subtle thumps of windshield wipers created a hypnotic musical preface in the film's opening moments, while the fluttering of ceiling fans and the stark, steady-handed focus on slight facial mannerisms reveals a vein of fierce bravery in the atmosphere the Coens shape. Lots of clever, methodical visual imagery slips into the film by way of cinematographer Barry Sonnenfeld's eye, growing dirtier yet remaining staunchly steady-handed while the story's tension mounts. There's a slow, nerve-clenching crawl over mounds of dirt as we witness a "Texas burial" later on, followed by the misty image the next morning of a car's erratic tracks along an unplanned path to the burial site, and it double-back to the film's overall nature: a crazed trip with a destination, but a path that's simply not predictable. And the chillingly beautiful climax isn't to be forgotten, with smoky bullet holes pouring light through their exit points. Reliable performances from the quartet of primary actors dictate a lot of the film's unerring intensity. A young Frances McDormand, in her first on-screen appearance, unassuming communicates Abby's mounting moral discomfort against John Getz' everyman gruffness, up until the film's draining climax -- which places hefty demands on McDormand's wide-eyed, addled self. With her back against a dark wall and the whites of her eyes bathed in moonlight, arguably the film's apex, she nails the right mix of fear and industriousness. The wild eyes and frazzled rigidity that Dan Hedaya brings to the bar owner, Marty, inadvertently adds a few layers of history and complexity to the character, where his riled-up jealousy makes us wonder about a time and place where he and Abby were linked. 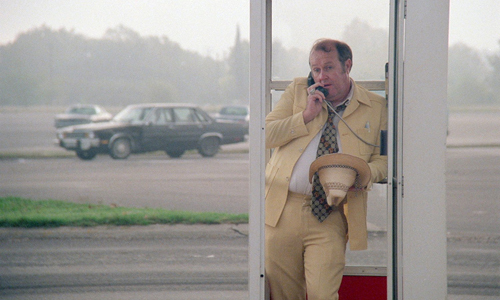 But if you don't watch out, the quirky and capricious awfulness of M. Emmet Walsh's private detective, Loren Visser, might sneak up and steal the show. As the Coen Brothers navigate the deliberate ninety-minute thrust in Blood Simple, their craftsmanship holds onto that timeless property mentioned early on. Bathed in '80s-brand neon light, with high-top shoes shuffling across our vision, period-appropriate cars and everything else, they're restrained and given inclusive life by the lens' lyrical viewpoint and the brothers' capacity to hold attention with raw, stirring energy. Really, much of Blood Simple's agelessness stems from the sheer filmmaking precision propelling it, where there's next-to-nothing out of place or missing in a reinvigoration of film noir's melancholy, meditative styling; the look, attitude, and flow of its often bleakly farcical corkscrews still impresses with inextinguishable thrills and innovation by way of clever genre recycling. And it proves to still be a relevant piece of cinema, an impressive feat considering many directors' early film stand as little more than relics showing how far they've come. Blood Simple shows where they already were: fully-armed with their perspective at the ready.